Putnam legislators have joined County Executive MaryEllen Odell in criticizing the Federal Energy Regulatory Commission (FERC) for raising Hudson Valley electricity prices by focusing on the “wrong factors.” Last month Odell appeared be… Please login below or purchase a subscription to the Putnam County Courier to access this content. Nan Hayworth Former Congresswoman Nan Hayworth is engaged in a close race to regain her seat in Congress representing the 18th district against Congressman Sean Patrick Maloney. It appears at the moment that the race is in a dead heat. As of Tuesday… Please login below or purchase a subscription to the Putnam County Courier to access this content. Members of the Putnam Emergency Response Team Sunday unveil the county’s newest piece of armored equipment that will be used during tactical and rescue operations. 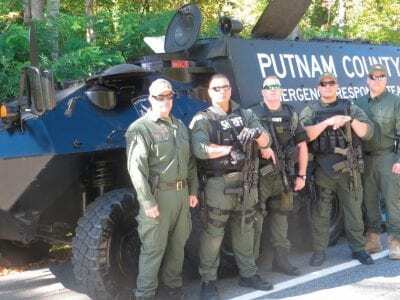 Members of the Putnam law enforcement community hope they never have to use its … Please login below or purchase a subscription to the Putnam County Courier to access this content. County Executive Odell delivers her address. 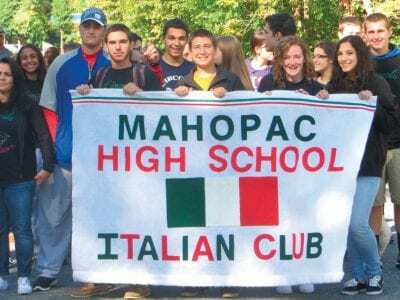 County Executive Mary Ellen Odell’s 2015 budget, unveiled last Wednesday evening in Mahopac, is being scrutinized line-by-line by members of the Putnam Legislature in committee. The lawmakers met every nig… Please login below or purchase a subscription to the Putnam County Courier to access this content. 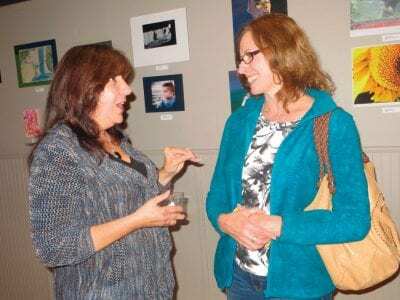 Margaret Carey (left) and Jeanne Stein, both of Brewster, are enamored by the work on display. The Village of Brewster is becoming a cultural hub of activity these days thanks to the dedication and hard work of the Southeast Cultural Arts Coalition a… Please login below or purchase a subscription to the Putnam County Courier to access this content. Carmel Rotarians will be asking the public to “fill the truck” this weekend by donating groceries for local food pantries in the Carmel, Mahopac and Brewster area. Members of the Carmel Rotary whose motto is ‘service above self&rsq… Please login below or purchase a subscription to the Putnam County Courier to access this content. The Hamlet of Carmel Civic Association is sponsoring its fifth annual Halloween Parade on Sunday, October 26, 2014. The HCCA Halloween Parade is for children from pre-school up to fourth grade. Children will be assembled in the parking area behind t… Please login below or purchase a subscription to the Putnam County Courier to access this content. Saturday promises to be an evening for the ‘wearing of the green’ when the Emerald Association of Putnam County hosts its 40th annual dinner dance. The affair is planned for the Vail’s Grove Pavilion in North Salem and will feature… Please login below or purchase a subscription to the Putnam County Courier to access this content.